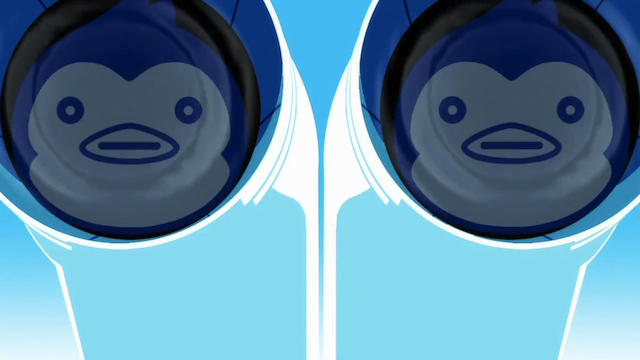 Episode 10 of Mawaru Penguin Drum returns to the events following the tearing of the diary. 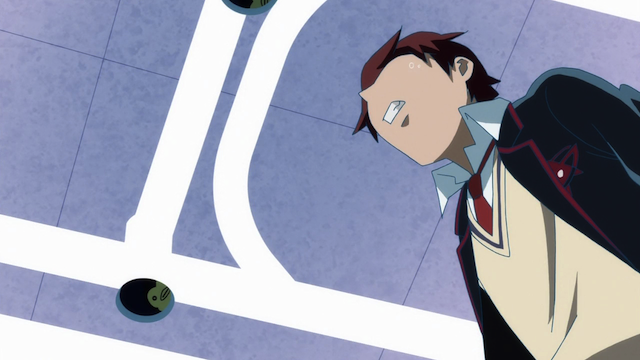 Shou is still in danger, but in an unexpected way. Kanba is serenaded and receives some gifts. The dark penguin makes its move. Also, a new agent appears, with his own survival strategy. When last we saw Ringo and Shouma, the diary was half stolen, and Shou saved Ringo, at the expense of getting hit by a car himself. 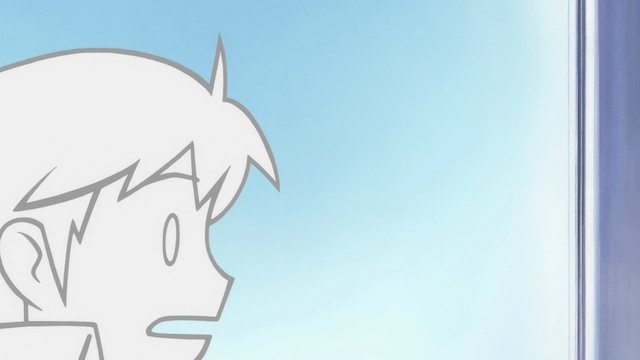 Some people complained that the art wasn't as good this episode. 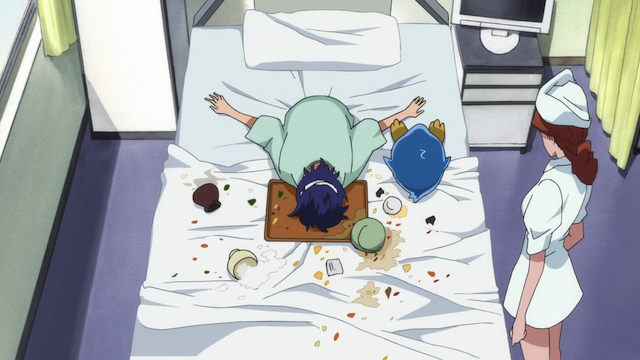 Masako Natsume drugs Shou's pudding and kidnaps him. 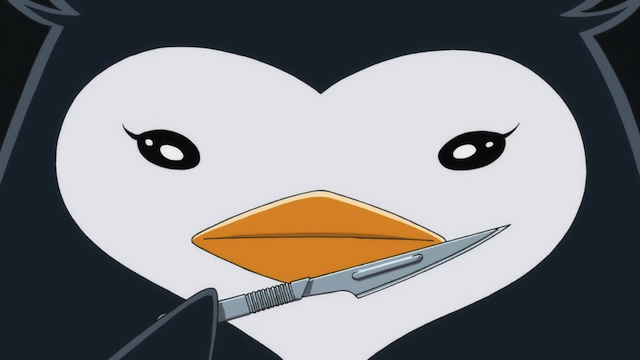 Esmeralda, Masako's black penguin threatens Shou. Kanba heads to the hospital roof, where he is told to bring the rest of the diary, else his brother will be brutally tortured. 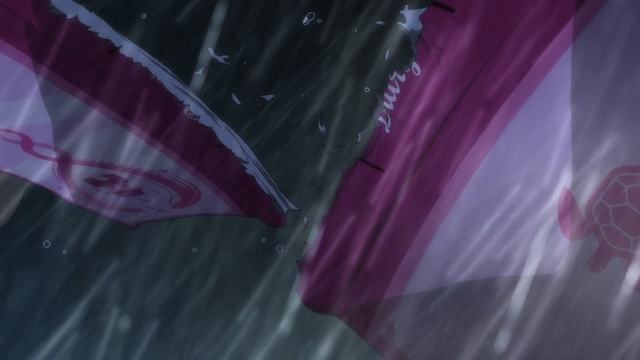 I really liked the sequence which starts with Kanba on the roof. 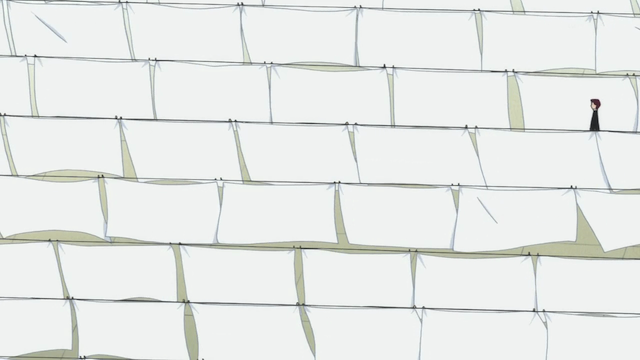 First, the setting (on a roof, and the maze of sheets) reminded me of Utena. It was a very stylish location for a showdown. 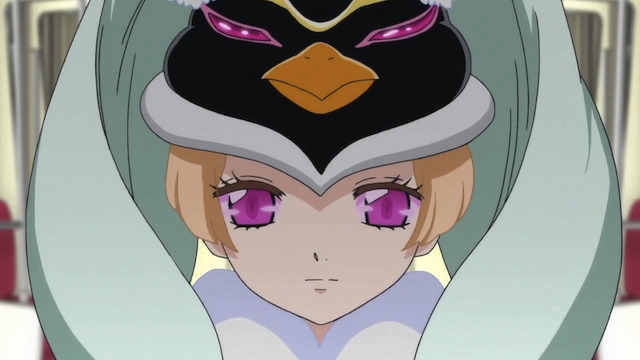 As distorted, slow music is played on giant penguin speakers, Kanba struggles to follow Masako down from the roof to the basement, where Shouma is being held. The music in this sequence was very effective in creating an oppressively surreal atmosphere. Draggle credits Vucub Caquix with identifying the music as Dvorak’s New World Symphony. Be sure to check out the post, as it includes a lot of interesting speculation about how different characters are related. AJtheFourth expands on the usage of Dvorak in the context of Night on the Galactic Railroad. Anyways, Kanba is forced to confront gifts he has previously rejected: bento, cake, and sweater. 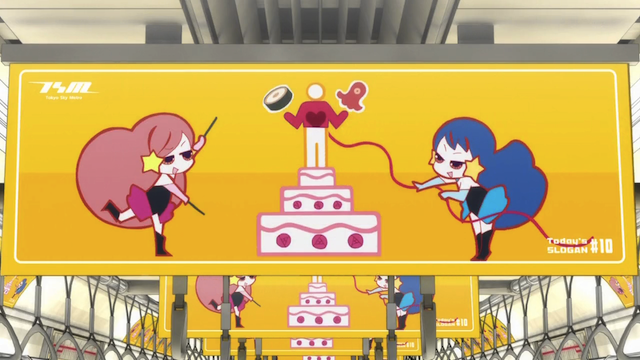 We know Kanba rejected such gifts from girls because of a conversion with Himari early in the episode, then he encounters these gifts on the way down to find Shou, and finally all three are shown in this Public Service Announcement. There are two plausible theories, one is that these are gifts that Masako had given him. The other is that Masako didn’t just erase the memories of Kanba’s previous lovers, but actually stole their memories, meaning she didn’t give him these gifts, they did, but she has the memories now. Either way Masako seems pretty unhappy with Kanba, and forces him to wear the sweater. In the end, someone (there is a difference in opinion online as to who) gets the rest of the diary from Ringo, by claiming that Kanba has been led into a trap, and that Shou will suffer if it isn’t turned over immediately. I’ll admit that there is some ambiguity, because the timing looks like Masako is busy with Kanba while the diary is being taken. On the other hand, Masako says that she has recovered the diary at the episode end. The silhouette of the person who took the diary is clearly that of a woman, but it could be that Masako is working with someone else. I tend to think Masako was the one who took the diary, and that theories that she is working with, e.g. Yuri, are incorrect. Mario. Another shocking revelation at the close. 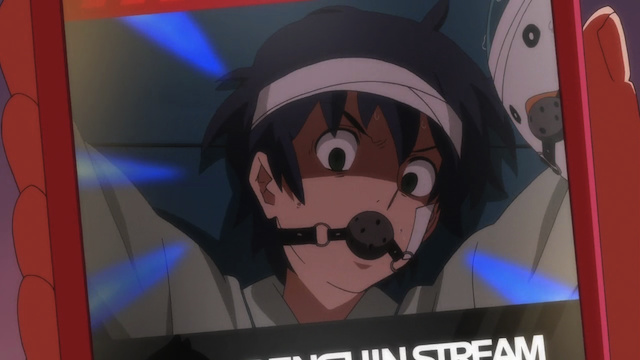 Besides the complete loss of the diary, the most important part of the episode was the appearance of Mario, another individual who has an emperor penguin hat, and who shouts “survival strategy”. It seems that this might very well be the person Himari we saw Himari with in the “child broiler” scene last week. What does it mean that he is with Masako? Are the two survival strategies different or the same? 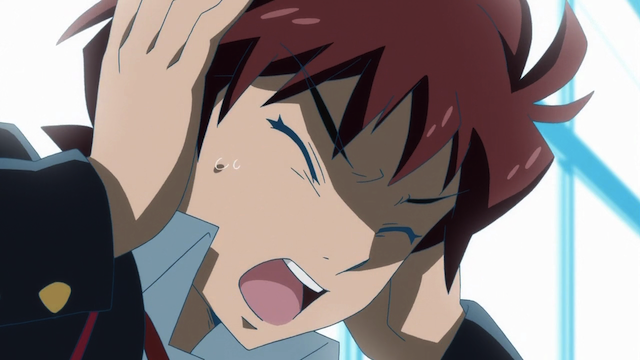 How will Kanba react when he finds out that Ringo gave up the rest of the diary?